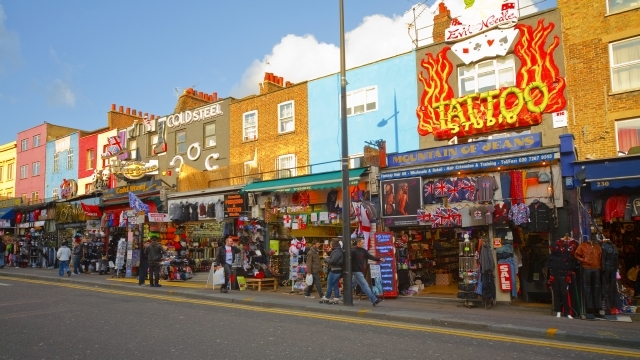 London’s Camden Town offers an eclectic mix of markets, cuisines and live music venues. Check out London Top Sights Tours guide to Camden town to plan your perfect day in the birthplace of punk. Camden Town is a weird and wonderful part of London. Located North of central London, just 1 stop away from Euston train station it’s a right of way for tourists to visit to marvel at the crazy shop fronts, check out Camden Market for some yummy food and perhaps see the canal lock open up. If you love Camden chances are you love shopping! Take the Tube to Camden Town, then head north along Camden High Street past stores selling Doc Martins, goth and punk clothing, body piercings, tattoos and more. Allow yourself a few hours to explore the extensive Camden markets. Top tip: Don’t miss the futuristic styles of Cyberdog. Camden is one of the top places in London for vintage gear. In Stables Market you’ll find stores and stalls selling new and second hand clothes, shoes, accessories, homewares, posters, furniture and music on vinyl. There’s also lots of new, retro-style stuff, plus vintage-style hairdressers and beauticians. The Stables Market (located to the north of Camden Lock Market on Chalk Farm Road₎, is considered to be the “oh so boho” of all the markets in Camden Town, and is known especially for its gothic clothing and accessories. With nearly 700 different shops to choose from, here you can also find vintage clothing, retro furniture and homemade crafts as well. If you’re hoping to refresh your wardrobe, then a visit to the Buck Street Market is a must. This market is located on Camden High Street (a two-minute walk away from the Camden Town Underground Station), and specializes in clothing of all shapes, sizes and styles. Buck Street Market is entirely outdoors, and contains 200 stalls which are scattered throughout several narrow alleyways. Although this market’s primary focus is on clothing and accessories, you can also find vintage and handmade jewellery here as well. To change things up a bit, be sure to check out the Inverness Street Market (to the west of the Camden Town Underground Station). It may not be as big as the other Camden markets but don’t let that deter you, as here you will find a variety of different specialty shops, as well as countless bars and restaurants. It is also a popular haunt among locals for its fruit and vegetable markets, which have been around since the early 1900s. And although it isn’t technically a market, Camden High Street is a highly popular shopping area, and is packed full of independent shops, pubs and restaurants, many of which feature some interesting designs and logos on their facades that are worth taking a photo of. As a matter of fact, no Camden Town photo collection would be complete without a shot of the massive black and orange dragon at Max Orient (273-275 Camden High Street), or the brightly-decorated elephant at the Namaste Indian Restaurant (243 Camden High Street). Although Camden may be famous for its hip shops, we cannot forget the food and drink venues that made it famous! There are loads of great pubs in Camden. Chill at the Hawley Arms or The Lock Tavern; rock with the rockabillies at The Elephant’s Head; kick on until way past your bedtime at The Good Mixer; hobnob with goths, emos and metalheads at The Devonshire Arms; or drink a toast in the Spread Eagle just off Parkway. ou’ll find food from around the globe at Camden’s many eateries and street vendors. If you’re planning to catch a performance, the Roundhouse has a great pre-theatre menu. Check out Italian treats at Trufflesecco, Masala Zone’s delicious Indian dishes or pan-Asian cuisine at Gilgamesh, where you can stay on to enjoy the trendy bar and club. Camden restaurant, bar and nightspot Shaka Zulu serves South African cuisine and entertains guests throughout the evening with live music and dance. No matter what you choose do yo in Camden you will never be bored!